When you’re preparing to knit in the round, joining is a critical step. Your pattern will tell you how many stitches to cast on, and then it will ask you to join in the round, being careful not to twist the stitches. Even one little twist will result in a potentially unusable piece of knitting, so it’s worth taking your time and making sure that everything is lined up properly before you continue. When you’re ready to join to knit in the round, you’ll need to turn your work so that the last stitch you cast on is at the tip of the needle in your right hand, and the first stitch you cast on is at the tip of the needle in your left hand (in my photos, I used a circular needle but the same applies to double pointed needles). 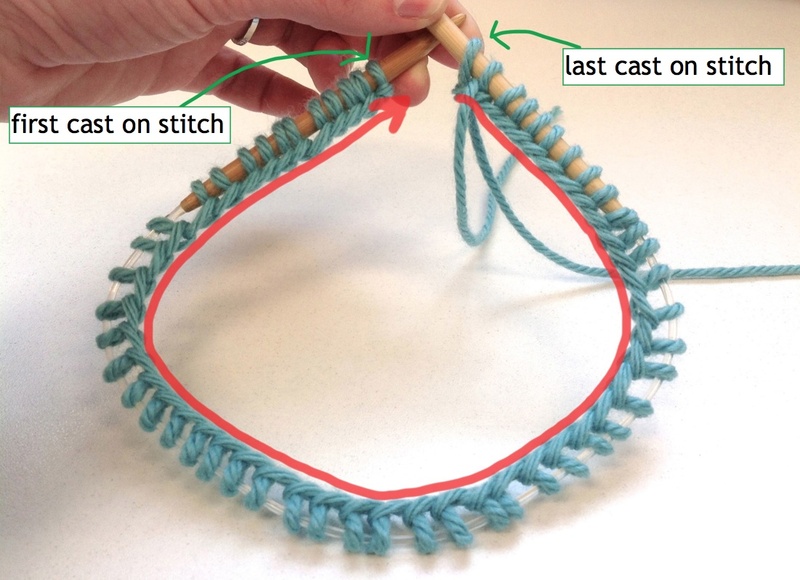 The red line is running parallel to the cast on stitches, and you can see that it doesn’t twist around at any point—it forms a clean circle. If your project looks like this, you’re ready to work the first cast on stitch and your join will be complete. You can see how the red line that follows the cast on is twisting around the needle before straightening back out at the first cast on stitch. It’s easy to fix this after you’ve identified the twist—just take hold of the stitches with one hand and spin them on the needle until the twist is worked out and it looks like my first photo. Once you’re confident that there is no twisting, you’re ready to work the first cast on stitch and continue with your pattern! Any tips when working with a large number of stitches on your circular? I find that it is with a bunch of stitches that I have a harder time making sure they aren’t twisted. I agree – with a lot of stitches squeezed onto a needle, it can be very hard to avoid twists. Sometimes I will knit the first row before I join, and then join in the round after that – having a little more fabric hanging down from the needle can help make twists easier to spot. Then I’ll use the tail to sew up the little gap from that first row. While I haven’t tried it myself, I’ve also seen knitters anchor the cast on with periodically placed paperclips, helping to hold the stitches down. 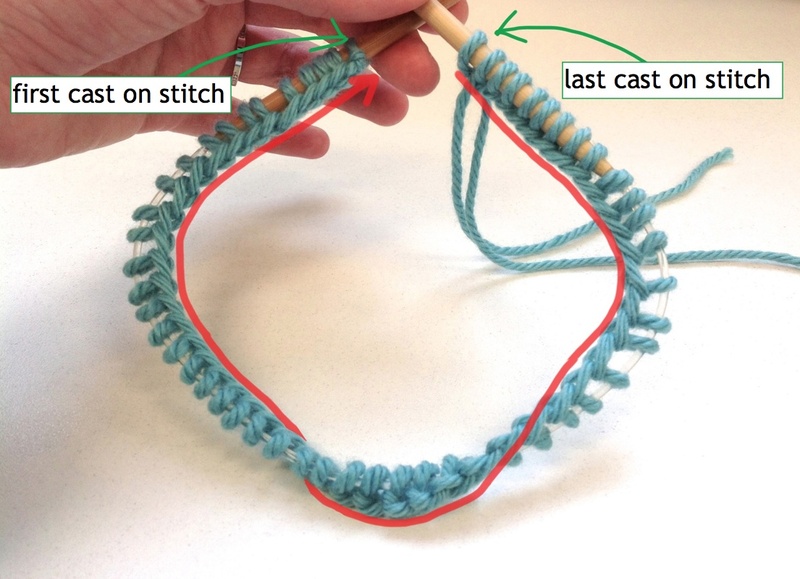 You can also cast on an extra stitch and then knit the first and last stitch together. Thank you for this helpful information. Just yesterday, I cast on for a cowl (204 stitches!) and worked 5 rows before I realized it was twisted. Argh!! It really pays to check and double-check this, since there’s no way to fix it besides starting over at cast-on stitch one! Thanks Lori – it’s so frustrating when that happens! Hi there. I am having a nightmare knitting in the round. Something keeps going wrong. I am trying to do a K1 P2 for the rim but keeps going funny at the joining. Anyway I have one question, One thing that is confusing me, is that my cast on tail is at the first stitch. How comes yours is at the end?! Alice, if you contact patternsupport@berroco.com, Martha should be able to help you. If I am using a long tail cast on, I use the German Twist cast on when knitting in the round as I find the stitches stay fairly straight on the needles. When I use the regular long tail cast on, my stitches coil around my needle and wire making it much more difficult to ensure all my stitches are lined up correctly before joining in the round. Yes, the cast-on type can make a difference! I’m a fan of German Twisted myself. To join, just knit with the tail and the working yarn and start knitting for a few sts, dropping the tail and continuing. Truly invisible and no join gaps as with other join methods.